Marshall's Mid ANC takes what made the 2017 model instantly recommendable, but adds active noise-cancelling to create surprisingly capable pair of on-ear headphones. When Marshall-branded headphones first started appearing on the market, sceptics would undoubtedly see it as an crude effort to milk the Marshall brand's strength. Surely a pair of headphones could never be as brilliant as the amplifiers used by the world's biggest rock stars for so many decades? We thought the same until we tried the Mid headphones, which launched in 2017. For their price, these were an attractive, rugged and great-sounding pair of cans. Now, the Mid is back, but this time with a new weapon: active noise-cancelling tech to shrink the distracting sound of the world around you. If your ideal look in a pair of headphones is the equivalent of Jimi Hendrix's amp stack on your head - complete with coiled cabling - then you're in luck. The Marshall Mid is that pair. Everything about these headphones screams classic late 1960s/early 1970s guitar amplifiers, playing up to that renowned Marshall heritage. It starts with the carry case, which is made entirely from a pebbled black imitation leather. It's slightly padded under the surface, and lined with a deep red felt on the inside. Trivially, this deep red velvet mimics the jacket worn by Jimi in one of his most iconic photos. And as if the reference to the company's early roots weren't obvious enough from stylings alone the headphones and case are both stamped with "EST. 1962". Adding to this styling, the included 3.5mm-to-3.5mm cable is designed to look like those classic coiled guitar leads too, complete with the right-angled, gold plated jack on the phone end. On the underside of the Mid ANC the headband is generously padded, covered in a soft felt-like material. It's quite a close-fitting headband, but not so tight that it's uncomfortable, and thanks to the nicely padded earcups, the on-ear design doesn't cause excess discomfort either. We found wearing them for one to two hour periods was easy - but any more than that and they do get a little uncomfortable. Credit has to go to design team's approach to button design. The most useful button lives on the left earcup - and we use the term "button" lightly, as it's more like a flatten multi-directional joystick - used to play/pause, long-press to switch the headphones on or off, and even used up, down, left and right to adjust the volume and skip through tracks. The other button, on the right earcup is a simple switch mechanism, designed purely to activate and deactivate the new ANC feature. The one design element we weren't convinced about was the headband adjustment mechanism: it clicks quite firmly as you extend it, but it's quite stiff and difficult to adjust. Certainly not as easy or friction-free as most other headphones we've tried. Still, the adjustable part is built from metal, making it durable, while the hinges on the forks leading to the earcups mean they can be folded away neatly for easy storage. We liked the original Marshall Mid headphones a lot. The updated 2018 model is similarly impressive, delivering a punchy sound that's warm and immersive. For relatively small headphones, that's big delivery. While bass and midtones are given some prominence, they don't drown out the high-end tones or vocals. There's detail and warmth in equal measure, and that's an ideal mix for the casual listener. Whether you enjoy the overdriven guitar sound in, say, Metallica's Sad But True, or George Ezra's cleaner finger-picking in Pretty Shining People, you'll no doubt enjoy the Mid ANC's audio offering. The big new feature in the Marshall Mid ANC, as the name gives away, is active noise-cancelling. As with most other ANC headphones we've tested, this does a great job of cutting out low and droning background noise. Even with no music playing and ANC activated, it makes a noticeable difference with the typical train/plane background noise, so you can focus on your music. Switching the ANC on or off is as simple as flicking that physical switch. There's no dedicated app for controlling it (so no EQ adjustment), or adjusting the level of how much noise-cancelling you want, like we've seen on other headphones such as the Sony WH-1000XM2. The aim is to keep things simple. We like that, but understand that some buyers will want more control. The Marshall Mid ANC's claims of 20 hours of music with ANC and Bluetooth switched on isn't far off the claims offered by other, more expensive headphone makers. Similarly, the 30-plus hours with only Bluetooth engaged isn't dissimilar to comparable products. In our testing, the Mid ANC didn't deliver Bose or Beats levels of battery life. Obviously, mileage will very depending on your use, such as how loud you're pumping the music into your lugholes. Sadly, in our testing, we didn't get close to the 20+ hours of use. In fact, it was closer to 10-15 hours with ANC switched on, that's considerably less than others we've tested. Still, it should be enough for a week of commutes. We tested the headphones with a handful of different phones, and the Bluetooth connection was always solid. We tested on an iPhone, with a OnePlus 5T, and a Sony Xperia XZ2 Compact. The latter two performed consistently, thanks to the aptX support, and just to reassure us that this high-end tech was active there's a little notification that pops up (on the OnePlus, that was a persistent notification). Of course, with iPhone - due to Apple designing its own custom processors - aptX isn't there, but the experience was just as good anyway. Marshall's Mid ANC takes what made the 2017 model instantly recommendable, but adds active noise-cancelling to create a surprisingly capable pair of on-ear headphones. What's more, they'll cost you so much less than competing on/over-ears from other more well-known brands. If you've long wanted a pair of noise-cancelling cans, but don't want to pay close to £300 to get them, the Mid ANC could be the answer to your prayers. Especially if you're into that classic 70s rock vibe. Bose's second generation QC35 offer sound and comfort by the bucket load and - despite being ear-engulfing over-ears - are very portable. They fold down to a size that's just as easy to carry around, if not more so, than the Marshall. They only cost £40 more too. Oh, did we mention they also have Google Assistant baked in? 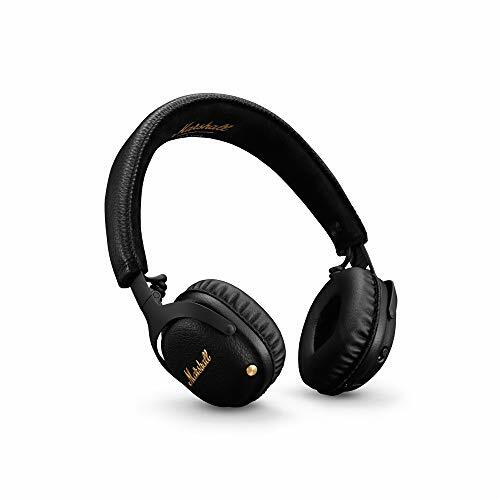 If you can do without noise cancelling, you can pick up the original Marshall Mid Bluetooth headphones for around £100 less than the new model. That's some saving, and great value for a pair of headphones that sound brill.